Here’s a riddle: how do you make a grown chef cry? Cutting into a ripe onion you say? Nope. It’s pulling out your prized cutting board only to find out that it has warped. 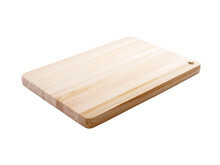 Whether that cutting board is a generational hand-me-down from your great-grandma Sue who proclaimed the board was made from the original planks of the Mayflower itself or just a battered hunk of wood from the dollar store, every chef feels a deep pang upon seeing a warped cutting board. 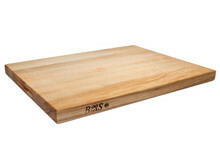 Most chefs think that once a cutting board is warped that it’s irreparable. The truth is, depending on the severity of the warp (also known as “ cupping”), you may be able to fix it at home with a few simple methods. In this method, what you want to do is place your cutting board into a bucket of hot water let it soak until the water is all the way through. 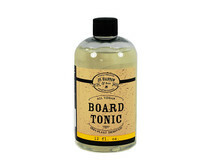 A few hours should suffice but if you have a thick board, you may even let it sit overnight. Once it is soaked through, place it on a flat surface and put flat object over the cutting board (a plank of wood, baking sheet, etc) and then add a heavy object on top of that as well. The heavier, the better; a stack of books or a cooler full of water would work. If you have wood clamps, and can sandwich the cutting board, even better. Now, this repair method may sound strange, but what you’re essentially doing here is trying to warp the wood board back into place by expanding the wood fibers with water and waiting for the board to dry out. Be patient, as you want the board to be completely dry before taking the weights or clamps off, so it should take 2 to 3 days. You can also point a fan at the board to help it dry faster. The goal is for the wood fibers to conform back to its original flat shape upon drying. This same concept is what professional cutting board manufacturers such as Larch Wood use to prevent warping, as they kiln dry boards under slabs of stone weighing thousands of pounds. 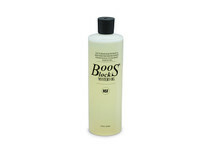 This removes both moisture and pressurizes the board flat. In situations where your board is 1” or less in thickness and only slightly warped, you may attempt to fix with this method. Be warned that this method can potentially cause your board to crack, depending on the severity of the warp and condition of the wood, so try at your own risk! First, get a clothes iron and a wet kitchen towel. Place the board down on a hard, flat surface with the warped side facing up. Then put the wet towel over your board and turn on your clothes iron. Once it is hot, begin ironing your cutting board just like you would with a wrinkled set of clothes and use your steam button liberally. Be sure to put some elbow into it, as what is at work here is a combination of heat, pressure and moisture to try and bend the wood back into place. The moisture makes the wood malleable, while the heat and pressure are the forces that are forcing the wood fibers back. The principle here is to cause the wood fibers to expand once again and flatten out the board as a result. First, place a tall pot 1/3rd filled with water on the stove. Second, place a colander into the pot and then rest the cutting board over the top of the colander, concave side facing up (that means the “bump” toward the bottom). Slowly bring the water to a simmer until you see steam coming and hold. With luck, the heat and moisture from the steam will eventually cause your cutting board to flatten out as the fibers start to evenly expand out. 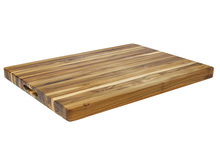 Note that steaming has the highest chance of cracking your cutting board due to the expansion of the wood. If you are using this method on an end-grain board or butcher block, be very careful to use a low simmer, raise the board high as possible or use a very large pot to uniformly steam the board. If you steam a concentrated area, that section can swell and cause the surrounding wood joints to rupture. Expect 1 to 2 hours and keep watch that your water doesn't boil or run out, otherwise you'll have bigger problems on your hands. Once and if your cutting board fixes itself, it is advisable to load weight on it while it dries (similar to method one) to ensure it doesn't warp again. As a truly last resort, if your board simply won’t bend into place again, your only fix is to physically modify the cutting board. While you may not have woodworking tools at home, a local woodworker or furniture maker may be able to help. 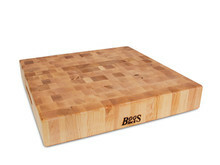 For an edge grain cutting board, you would want to run the board through a planer to take off the uneven ends. 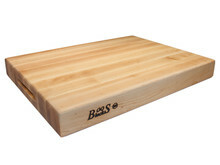 This will reduce the thickness of your cutting board of course but fix the issue. For an end grain board (example: John Boos end grain chopping block), your best bet is a wide belt sander that would essentially sand the board down so that it is even. Attempting to use a planer on end grain board would likely be too tough on the saw blade and result in damage. While we hope one of the above methods work out, just remember that the number one cause of warped boards is improper maintenance. Having a wet board, especially when only one side gets wet, will cause uneven expansion and contraction. You always want to make sure that you don’t expose your cutting board to water any longer than necessary and to always dry it off as soon as you are done cleaning. Consistent oiling of your board with proper oils will both prevent water from seeping in as well and keeping the board from drying out. Unfortunately, even a perfectly maintained board can warp due to a number of things such as humidity, how long the timber was seasoned, the type of wood and just plain bad luck. That said, if you have a cracked, warped or just plain ugly cutting board, you can win free kitchen gear in our upcoming monthly “Ugly Cutting Board” contest. 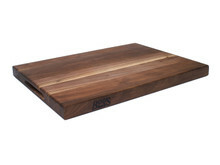 Simply email a picture of it to help@cuttingboard.com with a back story about your board and you will be entered to win, along with receiving a free 10% coupon off your next purchase on CuttingBoard.com. Got any tricks of your own to flatten out a warped cutting board? If so, let us know in the comments below! Or if any of these methods worked for you, please leave a comment as well.